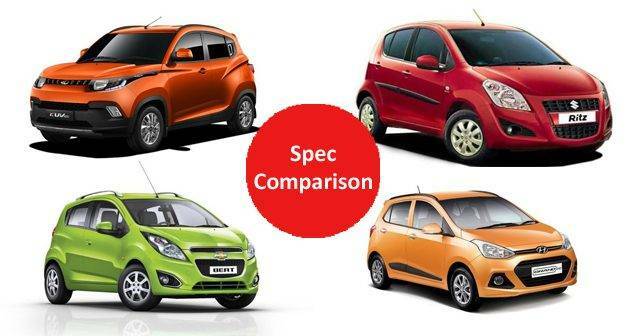 While Mahindra believes that it competes directly with the Maruti Suzuki Swift, we deem it fit to be a better competition with the Ritz from MSIL. In addition to that, in the same segment, customers also have the options like the Grand i10 from Hyundai and the Chevrolet Beat. Though the Ritz and the Beat have been in the market for quite some time and do seem a little outdated in terms of its design compared to the brand new Mahindra, the Hyundai Grand i10 which was launched in 2013 can still hold a candle to the KUV100's modernised styling. We take a look at the specs of all 4 cars and compare the four vehicles with their diesel engines to see which one fares the best in each category. When looking at overall dimension of each vehicles, the Maruti Suzuki Ritz is the longest of the four. But with the KUV100's SUV like design, despite being 100mm shorter in length, the Mahindra is still wider, taller and has a much longer wheelbase than its competitors. On ground clearance however, its the Chevrolet Beat does provide the best in class ground clearance. But the Beat is at par with the Mahindra in carrying fuel. brimmed up, both vehicles can carry 35 litres of fuel, though the Ritz and the Grand i10 from Hyundai both can carry 43 litres which is more. The Maruti Ritz might have the biggest engine with 4 cylinders and 1248cc, the Mahindra being the most modern of the lot, deals with 50cc and a cylinder less, but still leads with more power with 77bhp. Though both the Maruti and Mahindra produce the same amount of torque, the Mahindra delivers it a little bit quicker at 1750rpm. As per their claimed figures, the Chevrolet Beat is the most fuel efficient of the lot with a fuel economy mileage of 25.44km/l* while the KUV100 is close behind with 25.31km/l*. The Mahindra, Maruti, Chevrolet and the Hyundai all use industry standard MacPherson strut suspension at the front, the KUV100 however gets a more comfortable twist beam at the rear. While all the cars have disc and drum front to rear braking system layout, only the Maruti provides a ventilated disc to resist overheating of the brakes. All cars get 14 inch wheels, but the Maruti has a slightly wider track, the Mahindra has thicker tyres when compared to the Beat and Grand i10's 165/65 R14 wheels. As safety becomes more and more a priority for Indian consumers, all four manufacturers provide ABS with EBD and front airbags. Though none are available as standard in any vehicle, but Mahindra does give the option even in the base variant. Hyundai has reputation of providing the most bang for the buck, therefore is the only vehicle that also comes with parking sensors in higher variants. Feature wise all four of these vehicles are quite evenly matched. They all offer the same amount of kit in the same price bracket. However, with the Mahindra being the latest vehicle of the lot, Mahindra has also fitted the KUV100 with daytime running lights in the head lamps. Another key factor that plays in the favour of the Mahindra KUV100 is that while the others can only seat 5 people in total, the Mahindra can accommodate 6 passengers with the optional 6 seater package. Since its launch in 2013, the Hyundai Grand i10 has been the best selling vehicle in the segment. the reason for it has been that it was the most modern and feature filled package that the Indian consumers could buy. This was followed by the Maruti Suzuki Ritz as Chevrolet is still struggling to compete with sales numbers through out the country with its cars. Now that Mahindra has gate crashed the party with a more new fresh vehicle with modern looks and features and brand new mFalcon diesel and petrol engines, the Mahindra might just be what the doctor ordered.